I like to think of Peter's house at Capernaum as the field hospital Pope Francis speaks of. The Gospels tell us that the people brought the sick and suffering from miles around to the door of Peter's house. 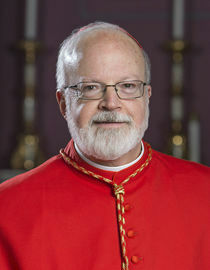 Below is the prepared text of the homily Cardinal Seán P. O'Malley delivered at the Chrism Mass celebrated at the Cathedral of the Holy Cross March 31. Welcome to our Chrism Mass where we all gather for the annual oil change and tune up. St. Jerome used to call the Holy Land the fifth Gospel and I believe he is right. Visiting the various places mentioned in the Gospel makes it come alive. Even without visiting first-hand, the various places mentioned in the Gospel can take on special meaning. We have named the chapel at the pastoral center the Bethany Chapel because at Bethany, Jesus went to be at home with his dear friends Lazarus, Mary and Martha. Martha's words from St. John's Gospel grace the wall of the chapel in Braintree: Magister adest et vocat te - "The Master is here and is calling you." When I was studying at St. Fidelis of Sigmaringen Seminary, affectionately called the Capuchin Agricultural School, I was part of the group that the rector dubbed "the Gerasenes." Father Rector would routinely rouse us at 2:00 in the morning to go to the parish cemetery because our herd of swine had escaped from their corral and had descended like those swine filled with legion of demons that hurled them into the sea; but our pigs descended upon the fresh graves of pious German farmers. There in the middle of the night, dressed in our night shirts and wielding baseball bats and two by four's we would drive the beasts back to their muddy pens. I dare say Monsignor Moroney does not have Gerasenes defending Cardinal O'Connell's grave in case of attack by possessed swine. Still, in all the Holy Land is the fifth Gospel. Today at the Chrism Mass I would like to reflect on the theological meanings insinuated by two different venues in the Gospel. According to the Gospels, Jesus' earthly life begins in Bethlehem and ends in Jerusalem, but the truth is that Jesus spent very little time in those two cities. Most of Jesus' life was spent in Nazareth and Capernaum. Indeed, Jesus was known as the Nazarene. Today's Gospel depicts Jesus giving his first sermon in the synagogue in Nazareth. The Gospel ends with the powerful phrase: "Today this Scripture passage is fulfilled in your hearing." The Gospel continues in another vein if we read on. First, Luke comments that "all spoke highly of Jesus and were amazed at the gracious words that came from His mouth." But it did not take long before they were saying: "Are you not Joseph's boy?" "Do here in your native place the things we heard were done in Capernaum." Jesus replies by pointing out that prophets are not accepted in their home towns and used Elijah and Elisha, who worked miracles for foreigners, as illustrations. The Spanish have a great proverb used to describe someone who changes from one place to another in the hopes of changing themselves. They say: "La fiebre no está en las sábanas": "The fever is not in the sheets -- it is in the patient." Sometimes the venue is part of who we are: "You can take the boy out of Southie, but you can't take Southie out of the boy." In Jesus' life these two venues are so important to His identity and ministry: Nazareth and Capernaum. After Jerusalem, they are the cities most mentioned in the Gospels. The concordance shows that Nazareth appears 15 times and Capernaum is mentioned 16 times. For a long time Capernaum was abandoned and even the memory of where it stood was lost. But Capernaum was rediscovered and in 1894 the Franciscan Custody of the Holy Land acquired the land and continued the excavations of the synagogue and the site of Peter's house, described in the fourth century testimony of the pilgrim Egeria. A couple of years ago I visited Capernaum with a group of priests. We saw the magnificent ruins of that synagogue built by the centurion whose prayer is repeated in our liturgy, "Lord, I am not worthy that you should enter under my roof." There in the place where Jesus gives us the eucharistic discourse recorded in chapter six of John's Gospel, we read aloud the 'I am the bread of life' sermon. There, at that synagogue where Jesus preached so many times is probably the very place where Jesus cures Jairus' young daughter, as well as the woman with the hemorrhage, and the man with the withered hand. The Gospels speak to us about Mary going to Capernaum with Jesus after the wedding feast of Cana and describe Jesus' activity at Capernaum, what he did on the lakeshore and in particular what Jesus did in the synagogue and in the house of Peter and Andrew (Mk 1:2a). This house was not only the place where Jesus lived, but it was "a house of formation" for His disciples, a beautiful and eloquent image of the Church. The Evangelist Mark sheds more light on Peter's house in the mystery of the Church. After proclaiming the parables and other teachings to the crowds, Jesus would give a "private teaching" back at Peter's house. The house was often so crowded with disciples it was impossible to enter. Mary and the apostles had to wait outside and the friends of the paralytic had to open a hole in the roof to get their friend close to Jesus. We celebrated Mass at the site of Peter's House. In the ruins there is evidence that the early Christians made a "house church" out of this compound where Peter, Andrew, Peter's mother in law and his extended family lived with Jesus. Peter's house was a beehive of apostolic activity, of preaching, of healing, of forming ministers. At Capernaum, as in our ministry, Jesus also experiences frustration, failure, disappointment. At one point Jesus complained that if Sodom and Gomorrah had as much ministry performed there as had been done in Capernaum, those people would have all been converted long ago. Our expectations, hope for success needs to be tempered by the conviction that one man sows and another one reaps. We cannot always have the consolation of the fruits of our labor. Our Capernaum can be tough. As I always say, being a Catholic in Boston is a contact sport. There can be a lot of heartbreak in Capernaum. After the death of Herod, Joseph takes Mary and the Christ Child back to the land of Israel, but hearing that Herod's son Archelaus was ruling over Judea, Joseph, warned in a dream, goes to Galilee, to the town of Nazareth so that what had been spoken through the prophet might be fulfilled: "He shall be called a Nazorean." But He could just as easily been called a "Capernaumer"
The two poles of Jesus' life are Nazareth and Capernaum. Reflecting on this reality has important implications for our own priesthood. Three decades of Jesus' short life on earth were lived in Nazareth. These years were an important preface to what followed in his public ministry. We must be convinced that Jesus' long hidden life was not a wasted period, or that he was treading water; it was a crucial part of his sojourn on earth, part of his identity and his mission. In Nazareth I was pleased to visit the Poor Clare Monastery where Charles de Foucauld lived as a gardener and handyman. I asked the nuns for the job; they said I did not qualify. In his homily for the Beatification of Blessed Charles de Foucauld, Pope Benedict XVI says that at Nazareth, Blessed Charles discovered the truth about the humanity of Jesus and invites us to contemplate the mystery of the Incarnation. Blessed Charles discovered that Jesus, who came to join us in our humanity, invites us to universal brotherhood. As a priest, Blessed Charles placed the Eucharist and the Gospel at the heart of his life; the two tables of the Word and of the Bread, are the source of Christian life and mission. At Nazareth, we see Jesus' kenosis, his self-emptying in the Incarnation. Jesus is sent by the Father to proclaim good news to the world. The long and hidden years of Nazareth are part of the Gospel message. Jesus at Nazareth takes on a poor person's condition and makes ordinary daily life a meeting place with the Father. Nazareth is the place of Jesus' hidden life, an ordinary life, a place of family life, of prayer, of work, silent virtues, hospitality, friendship, routine, a banal repetition of simple chores and tedious tasks, it is also a place of community sharing both sorrows and joys. It is a place of a simple lifestyle, of humble service and reciprocal love. In our lives as priests, we need Nazareth and Capernaum. There is a tension between the two but it behooves each priest to resolve that tension by embracing both aspects of our priestly vocation. Jesus spent 30 years in Nazareth and 3 in Capernaum -- ten times longer in Nazareth than in Capernaum. As Americans we are very prone to activism and more comfortable in Capernaum, but we need Nazareth if Capernaum is going to work for us. For a priest, Nazareth is that safe place, the intimacy of being close to a small circle of friends or family who share our faith and ideals. Nazareth is time and space to grow in our relationship with the Eucharist and the Word of God. Nazareth is where our intimacy with the Lord allows us to embrace a simple lifestyle, celibacy, persevere in ministry, and confront failure. Nazareth is that oasis of prayer and spirituality without which it is impossible to cross the desert, to carry the treasure to God's people waiting on the other side, in Capernaum. Nazareth keeps Christ at the center of our life, his friendship becomes the motor force in all our activities. Nazareth is about friendship, personal renewal, study, prayer, growing in self-knowledge, a sense of purpose born of our love for the Gospel. Even when He was in Capernaum, Jesus made Nazareth moments in His life, prayer late at night, the 40 days of retreat in prayer and fasting, hours in the Garden of Olives. Without Nazareth we can spin out of control and drift away from our God and away from our brothers. Without Nazareth we become too self-absorbed, obsessing about our privacy, our time, our hobbies, our creature comforts we use to compensate for celibacy, and other sacrifices inherent in our vocation. Nazareth can equip us with the deep faith life that gives passion to our ministry. Without Nazareth, Capernaum can become overwhelming, frustrating and can alienate us. Capernaum is the other pole in a priest's life. It is ministry, pastoral love, service, laying down one's life for the sheep. Just as in the Gospel, Capernaum is about preaching the Gospel and healing the sick. At Capernaum Jesus and the apostles are staying at Peter's House. The paradigm for Church is always family, with the in-laws and the outlaws and even the Mother-in-laws. Peter's household comes equipped with a mother-in-law who cooked for Jesus. Capernaum demonstrates Jesus predilection for the sick and the suffering. A Christ-like priest always sees a special mission to the suffering as a priority in ministry. As today's Gospel proclaims, our mission is to be messengers of the good news to the poor, and to liberate those oppressed by the circumstances of their lives. Our pastoral plan must underscore the importance of building communities that are indeed Christ's family. A priest must be a builder of unity in the family of the parish, connecting our people with God and with each other. Capernaum is also the venue for training people for ministry. The apostles received much of their formation at Peter's house. An important part of our task in Capernaum is to promote priestly vocations as well as lay ministry so that the Church will truly be an evangelizing community, calling people to be evangelizers and disciple makers. The culture of encounter and the art of accompaniment that Pope Francis speaks about so often must characterize our Capernaum experience. Much of Jesus' vocational recruitment activities center on the area of Capernaum. It was there that Jesus calls Peter, Andrew, James and John and Matthew. Part of our Capernaum experience of priests must be a constant concern for promoting vocations by challenging our young people to consider a vocation. A few years ago I went to my home parish to celebrate the 70th anniversary of the parish. 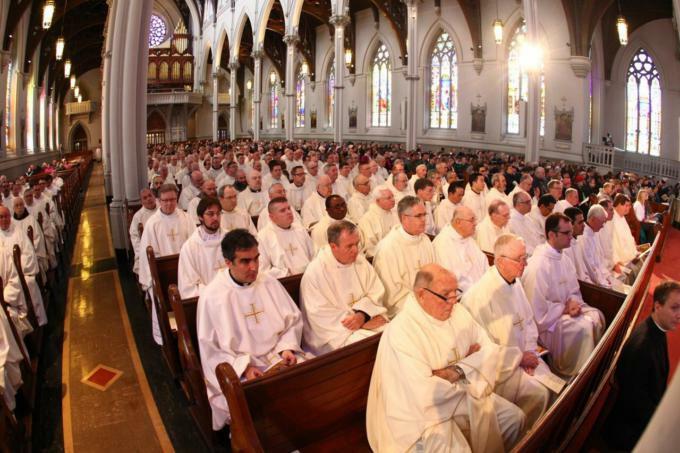 There were forty priests, vocations from the parish concelebrating the Mass. At our Saint Andrew's dinners and vocational retreats it is obvious that some communities are very serious about referring young men yet other parishes never send anyone. Our hope is that the pastoral planning process will help all our people realize how important vocation ministry is for the future of the Church. For our priests, inviting young men to consider a priestly vocation must be a pastoral priority. All studies indicate how powerful an invitation is when it comes from a priest. As it was one of Jesus' main focuses at Capernaum, it must be a priority in our Capernaum of daily ministry. It is the way we attend not only to the present pastoral needs of our people, but also the future needs of the community of faith. Nazareth and Capernaum need to be constants in the life of a priest. As we are living longer, we have another opportunity to spend more time in Nazareth, more time in adoration and prayer, so that like Aaron and Hur we can help hold up Moses' arms. Our prayer allows us to continue to contribute to the faith life of our Church. In the beautiful Gospel scene of the Presentation in the Temple, we see Mary with the baby and Joseph with the birds, but we also see the seniors praying, witnessing and encouraging. They are protagonists in the unfolding mission of the Church. Simeon and Anna are a sign of hope and a source of spiritual power in our Church. Many of our retired priests tell me how fervently they are praying for our Church. Their priestly service continues in the Nazareth mode of their ministry. Many of our senior priests whose tireless work built up the parishes and ministries of the archdiocese are now our prayer warriors whose intercession is a source of strength to our presbyterate and our people, as the center of gravity shifts from Capernaum back to Nazareth in their lives. To me, Pope Francis' call to embrace the culture of encounter and the art of accompaniment is reflected in the virtue, common to the Nazareth and the Capernaum, that of hospitality. In his pastoral letters where Paul describes the attributes of those who are to be called to ministry, hospitality ranks very high. The Epistles are sprinkled with a call to be hospitable. In Hebrews we read: "Let love of the brethren continue. Do not neglect to show hospitality to strangers, for by this, some have entertained angels without knowing it." Certainly an allusion to Abraham and Sarah, who show such gracious hospitality to three strangers at an oasis of Mamre. In the Parable of the Last Judgement, Jesus says: "I was a stranger and you welcomed me"; even those blessed did not know that they were welcoming Jesus in a distressing disguise, to use Mother Teresa's language. When we invite Christ into our lives, and that is what the hospitality of Nazareth is all about, Christ who is the guest becomes the host, as he did for the disciples on the road to Emmaus. At the Last Supper the first Eucharist and ordination is prefaced by the most profound ceremony of hospitality performed by Jesus who washes the feet of his apostles. Our pastoral planning and efforts at evangelization will be successful only to the degree that we be priests who live the spirit of hospitality of Nazareth as well as the hospitality of Peter's house in Capernaum. The hospitality of the Gospel is about welcoming the stranger and like the Good Samaritan making the stranger the object of our love, part of our community, even a brother. Gospel hospitality is always disinterested. When you have a banquet, Jesus says, don't just invite rich neighbors and friends who can reciprocate, but invite the poor, the cripple, the lame, and the blind. In inviting them we are inviting Christ and we will be repaid at the resurrection of the righteous. Hospitality is about building relationships and forming community. In our parishes, hospitality must be contagious and it should begin with the open welcoming spirit of the clergy who teach more by example and witness than by words. A great priest once said: "The two happiest questions a priest can hear from someone are: 'Father, will you hear my confession?' and 'Father, how can I become a Catholic?'" Whenever you visit a convent of the Missionaries of Charity of Mother Teresa, you will find in the chapel next to the crucifix the words "I thirst." Christ is thirsting for souls. The priest, like the Good Shepherd, is anxious to bring the sheep on the periphery to the center stage. The priest is always a man of hospitality welcoming the prodigal son or daughter, binding up the wounds of the stranger left half dead by the roadside, feeding the hungry with bread, forgiveness, and hope. The hospitality of Nazareth, welcoming Christ, letting the word become flesh in our hearts is what prepares us for the hospitality of Capernaum, of the field hospital. Today's celebration is to remind us that we are not alone, that our priesthood unites us to Christ and to one another in a profound and permanent relationship. The ordination ceremony where the entire presbyterate imposes hands on the newly ordained and then comes forward to give them the kiss of peace is a striking sign of the hospitality we need to practice with each other, looking out for our brothers, encouraging them and helping them. As we renew our priestly vows together, we commit to be part of an intentional presbyterate, a band of brothers committed to living the hospitality of Nazareth and of Capernaum, so that the love of the Good Shepherd will be present and visible, especially at the periphery. So that the anointing that we share may reach all of God's people and fill their hearts with hope and joy. Spelling bees are being relegated to the dustbin of the pre-virtual age, being surpassed by spell check on the computer, but I still find spelling bees stimulating. Recently, one of the arcane words used in the national spelling bee in Washington was Capharnaum. The definition in the Webster's Unabridged Dictionary is: a confused jumble, a place marked by a disorderly accumulation of objects, like the crowd in front of Peter's house in Capernaum. In the French dictionary, definition for the word Capharnaum is similar: "L'endroit en desordre..."
I am convinced that our ministry can be a Capharnaum -- a confused and disordered jumble - if the Nazareth values of contemplation, prayer, intimate friendship, the sense of fraternity are lacking. As we renew our priestly vows, let us commit ourselves to live with one foot in Nazareth and one foot in Capernaum to be a priest after the heart of the Good Shepherd.